Commuters returning to work after the summer holidays are being encouraged to get in the saddle and give cycling a go with the launch of six new Greater Manchester cycleways. 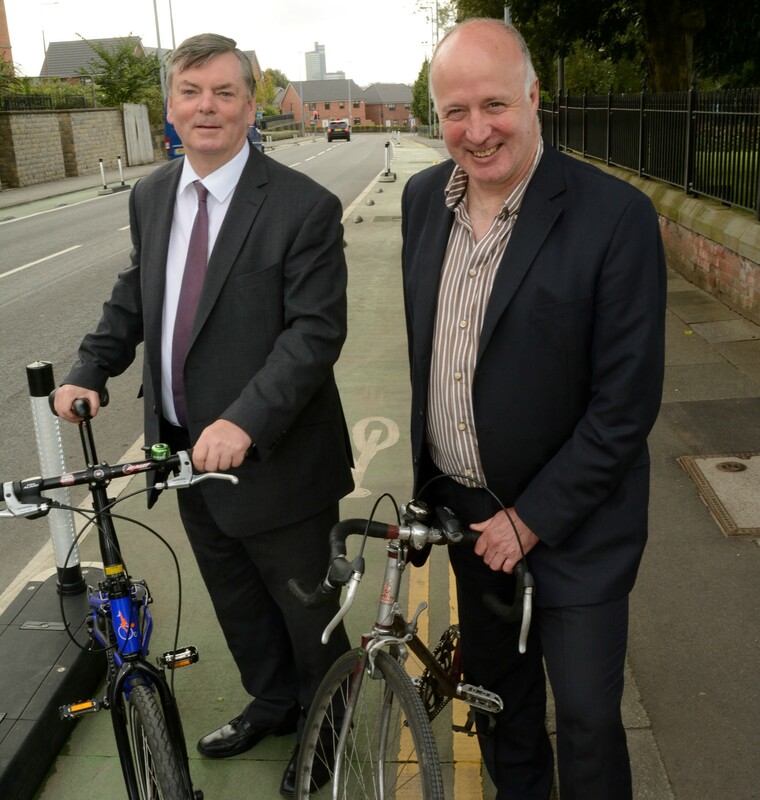 The launch, held at Broughton Cycleway, marked the completion of the first, £20 million phase of Transport for Greater Manchester’s (TfGM’s) ambitious £42 million Cycle City investment programme. The new cycleways have been designed as an attractive and convenient way to travel by bike, linking communities with town and city centres and areas of employment, education and training. Broughton Cycleway links Broughton with Manchester city centre and has innovative traffic islands and reflective bollards to separate cyclists and traffic along the 2km route, making it the UK’s longest cycleway of its type. Funded by the Department for Transport (DfT), the six cycleways have been delivered by TfGM in partnership with the five local authorities through which the routes pass – Manchester City, Salford City, Stockport, Tameside and Trafford councils. Councillor Chris Paul, Transport for Greater Manchester Committee Cycling Champion, said: “We’ve got big ambitions for cycling in Greater Manchester and we’re already beginning to see more and more people getting around by bike. “The incredible Olympics success of Team GB’s cycling team, based at the ‘Medal Factory’ National Cycling Centre in Manchester, will hopefully inspire more people to consider cycling for both work and leisure, and our aim is also to put Greater Manchester on the map as a great place to cycle, whatever your ability and wherever you’re looking to travel. Councillor Roger Jones, Executive Lead Member for Transport and the City Region at Salford City Council, said: “This is a fantastic new scheme to link Broughton to employment, education and leisure opportunities and onto the extended network to Salford Quays and MediaCityUK. Cycling trips have increased by 77 per cent since it opened. Nick Brelsford, Sustrans Partnerships Manager for the North West said: “These new cycle routes are a big step in the right direction to help Greater Manchester achieve its aim to make cycling a mainstream everyday form of transport. “Wilmslow Road and Broughton Cycleway in particular demonstrate different types of high quality cycle design, which although not perfect, could work on a larger scale across the city region. · Wilmslow Road Cycleway: connecting Didsbury village and Whitworth Park. The £20m first phase of the DfT Cycle City programme – of which the cycleways network is a key part – has also seen improved cycle parking and facilities at transport interchanges, railway stations, Metrolink stops, workplaces, and social housing sites; 11 schools benefiting from new cycling facilities and training through the Cycle School and Colleges programme; and training and support for people who would like to cycle more or who are new to cycling. The second phase – which is now under way – involves a further £22m investment by 2018 in additional new and improved cycle routes, four new cycle-friendly district centres, 10 new schools joining the Cycle Schools and Colleges programme, further improvements to cycle parking and continued cycle training and support. For more information on the scheme visit www.tfgm.com/Cycleways.